LEESPORT, Pennsylvania – A wonderful event, Berks Agricultural Resource Network (B.A.R.N.) 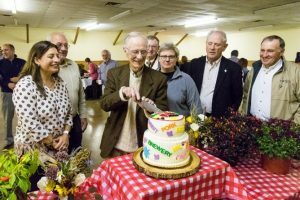 hosted its second annual Bountiful Berks Banquet with Sandy Witman, SKW Consulting, as Chair of the Banquet Committee, which was held at Leesport Farmers Market Friday night, October 26. It is a revitalization of the successful Farm to City event sponsored by the Greater Reading Chamber Alliance several years ago. In celebration of economic development of the agriculture industry in Berks County and Southeastern Pennsylvania, the diversity of attendees included farmers, producers, leaders, educators, administrators, consumers, and public officials. Some special guests included: State Senator Judy Schwank (award presenter), State Representative Barry Jozwiak (Exchange participant), Berks County Commissioner Christian Leinbach, as well as Reading City Council Members Donna Reed (Exchange participant), Brian Twyman (B.A.R.N. member), and Lucine Sihelnik (President of B.A.R.N.) The Pennsylvania Alternate Dairy Princess, Sam Haag, was in attendance and did a milk toast before the farm to table dinner, which featured locally sourced products. With the fun auction happening throughout the evening, attendees were able to bid on various items such as a Manatawny Creek Winery sweet wine gift basket, a photo canvas by Clyde Myers, a Gauker Farms beef bundle, Reading Eagle newspaper subscriptions, and wall hangings. The Farm and Business Exchange program included three pairs who “exchanged” jobs to experience a day in the life: Woody Weist, Leesport Auction, and Barry Jozwiak, Pennsylvania State Representative, Fox Horn Farm; Stephanie Younker, 4-Her and Leslie Peers, Conrad Weiser High School; Donna Reed, Reading City Council Member, and Stephanie Shirk, Penn State Extension. B.A.R.N. celebrated its 10th anniversary with commemorative mugs adorning the tables and a special cake that the past and current presidents cut together, which was baked and decorated by B.A.R.N. member Kim Weber owner of Kim’s Bakery. 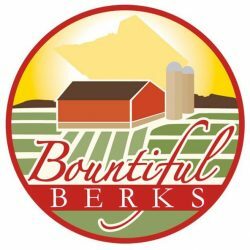 We look forward to seeing you next year for the third annual Bountiful Berks Banquet. The Berks Agricultural Resource Network (B.A.R.N.) is a non-profit organization formed in 2008 to serve the Berks County Agricultural and related food industries and rural communities. B.A.R.N. strives to cultivate opportunities for farmers, businesses, and consumers to grow everyone’s prosperity. Recognizing the need to collaborate, celebrate, and educate the community to strengthen agriculture in Berks County and Southeastern Pennsylvania.